If a sentence could summarize Diana Coole and Samantha Frost’s 2010 edited collection, it would be the editors’ claim that “materiality is always something more than ‘mere’ matter: an excess, force, vitality, relationality, or difference that renders matter active, self-creative, productive, unpredictable” (9). However, a sentence cannot capture the diverse arguments put forth in this collection, and hence, we must read on. 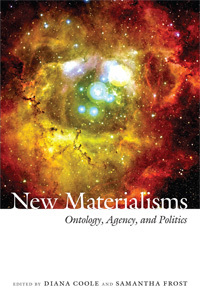 New Materialisms: Ontology, Agency, and Politics brings together essays that examine and contribute to a renewal of materialism in the humanities and social sciences, a renewal that likewise reworks understandings of matter, agency and capitalism. In their lengthy introduction, the editors claim that this new work follows from the recognition that textual approaches associated with the cultural turn and social constructionism are inadequate for understanding key issues in the contemporary world, such as climate change, biotechnology and global political economy. Moreover, modern particle physics, chaos and complexity theory, as well as the emergence of new concepts informing genetics research, have changed understandings of the composition of matter and life, calling for the formulation of new political and ethical theories. Although only some of the essays collected here explicitly respond to these concerns, the anthology as a whole contributes a substantial engagement with matter as a question or a problem. Read together, the tensions between the essays reveal—far from a simple metaphysics of presence, empiricism or positivism—the multifaceted, rich, creative and plural approaches that constitute contemporary cultural and political theory’s turn to materiality. New materialisms have been criticized for positing themselves as new only by caricaturizing poststructuralism as against matter and ignoring vast bodies of literature such as feminist work on embodiment. Indeed, Sara Ahmed’s essay in the collection, “Orientations Matter,” begins by explaining that she resists calling her work “a ‘new’ materialism” because she is indebted to “earlier feminist engagements with phenomenology that were undertaken during the period of ‘the cultural turn’” (234). One of the strengths of this collection is that it does not simplify the past to generate itself. Instead, it returns to texts that one might expect “new materialists” to dismiss or ignore. Thus, for example, Pheng Cheah’s astute contribution “Non-Dialectical Materialism” excavates Derrida’s materialisms without substance, Sonia Kruks’ “Simone de Beauvoir: Engaging Discrepant Materialisms” considers, through Beauvoir, the “circular flow” between the body’s decline and the social construction of aging, and, finally, Diana Coole’s “The Inertia of Matter and the Generativity of Flesh” turns to Merleau-Ponty to develop an understanding of matter as “generative, self-transformative, and creative” (93). Rather than moving away from deconstruction or phenomenology, these essays reengage these methods differently. At the same time, a second strength of this reader is its provocative novelty. The essays open lines of inquiry, explicitly calling for new research and providing seldom developed concepts. I am thinking especially here of Elizabeth Grosz’s, William E. Connolly’s and Jason Edwards’s contributions to the collection. In “Feminism, Materialism, and Freedom,” Grosz considers Henri Bergson’s understanding of freedom, which posits free acts not as those that have been chosen from amongst givens but rather as those that open onto to the invention of the new springing from the subject, expressing that subject and being incorporated into that subject. Against queer theory’s critique of identity and its understanding of subjectivity, Grosz’s essay not only suggests, with Bergson, that an act “is free to the extent that ‘the self alone will have been the author of it’” (144), but also that gayness is “an expression of who one is and what one enjoys doing, of one’s being” (153). Both these statements rest in stark contrast to contemporary cultural theory and thus are ripe provocations for thought. Likewise, Connolly’s “Materialities of Experience” includes many original claims. The text reads a rapprochement between three philosophers of immanence: Gilles Deleuze, Michel Foucault and Maurice Merleau-Ponty. While Deleuze and Foucault were critical of phenomenology, Connolly explains how Merleau-Ponty departed from those aspects of phenomenology the former philosophers criticized. Two of Connolly’s arguments in particular are especially alluring. The first, stitching Foucault with Merleau-Ponty, is Connolly’s claim that “power is coded into perception” (190). We are disciplined, in other words, to develop anticipatory expectations for what we will perceive. Connolly’s connection here has the potential to push Foucauldians to consider the power relations involved in the production of perception itself. Next, Connolly also suggests that Merleau-Ponty, Foucault and Deleuze each show “how a spirituality of some sort or other is always infused into experience, interpretation, and action” (197). This is a spirituality of immanence that is expressed primarily as an attachment to this world. Once again, New Materialisms provokes us to rethink and reread. Finally, Jason Edwards’s concluding “The Materialism of Historical Materialism” may, at first, seem out of place in this collection. Unlike the materialisms developed in the earlier essays, Edwards brings attention to the material practices that reproduce capitalism. Even more, Edwards distances his work from the others, contending that the concern over what constitutes matter has “little to do with historical materialism as an approach to social and political analysis” (281). Yet Edwards’s essay reads as a strong finale to the book because it offers a program for future research: to study the relationship between everyday practice and global capitalism. Edwards argues that although Michael Hardt and Antonio Negri’s Empire claims to be materialist, this materialism ends at the level of theory. The authors do not show how material practices actually come to constitute the diagram of power they describe. Edwards thus leaves the reader with a challenge: to bring attention to everyday practices in order to make visible the reproduction of capitalism. Overall, the essays collected here are varied and strong. For those new to the field, the editors’ lengthy introduction provides a good overview, and the essays offer multiple points of entry into questions of materialism, agency and politics. Given the variety of theoretical frameworks represented here, the book would have been stronger had the editors included an exploration of the tensions between the essays. For instance, are the practices that Edwards seeks to bring to light only human practices, or would a new materialism look to the agency, forces or vitality of non-human materialities in the reproduction of capitalism? How would this alternate focus change the understanding of global capitalism? New materialisms may exist in the plural, but the tensions between these pluralities are the points of interest that beg for attention. Stephanie Clare’s research interests include feminist and queer theory, humans’ interactions with non-humans, settler colonialism and science studies. She recently defended her dissertation, “Earthly Encounters: Readings in Poststructuralism, Feminist Theory, and Canadian Settler-Colonialism,” and will begin studying at Oxford University as a postdoctoral fellow in the fall. Her book manuscript investigates how taking into account the transformation of the earth under settler colonialism transforms central concepts that circulate in feminist thought: power, subjectivity, sexual difference and sexuality. Next Next post: We are Apocalyptic!